Time for one of those posts where I just dump a few photographs I’ve taken whilst roaming around. In between jobs, out running errands, walking the dog, on route to/from a commission, just popping around the corner to grab a coffee, the camera is always with me just to document the world I see. Sometimes I have mini projects in mind, other times I just see what the world serves me up (although generally I seem to find themes unifying what I create). Triptych Portrait Project #45 | Ricky Feather, a photo by bang* on Flickr. A selection from the full set can be found here – www.bangphoto.co.uk/triptychs. Currently in the process of setting up a place for the whole (current) set to reside. A man long overdue for the series. Ricky is the true story of cycling evolution. Starting young on the BMX he made a name for himself, got sponsers, travelled europe and a custom named frame. He has now become pretty much an all out roadie thanks to first a spell riding fixed gear. 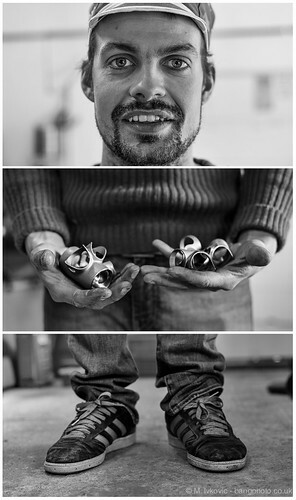 However this is only part of his recent story, the most inspiring part is his frame building business. A one man start up, custom building steel bike frames (pretty much in his shed) he’s since gone on to win numerous awards, best in shows, public choice awards, selected to build bikes for pro riders along with features in GQ magazine amongst others. This is just the tip of his list of honours, the main thing to take away however is his dedication to his craft. The acclaim helps build the publics awareness of his business but to Ricky the joy of turning a customers dream bike into a reality is all the reward he seems to need. Feather Cycles from Bespoked on Vimeo. How I got the shot. Back through time . . . . .